“Be the change you wish to see in the word” – Mahatma Gandhi. Isn’t that the reason Angela and I started this site? Not because we think the world is fascinated by what we may or may not be doing. But because we truly believe that by making small changes we can change the world… starting with our family. And sometimes when maybe it feels like we haven’t quite made enough of a stride, it helps to take a step back and look at what others are doing. TOMS is one of those companies that I found inspiring from the first moment I heard of them. On a trip to Argentina in 2006, founder Blake Mycoskie, met children that had no shoes to wear. Children in developing countries often must walk barefoot for miles to school, clean water and medical help. Wanting to help, he created TOMS, a company that would match every pair of shoes purchased with a pair of new shoes given to a child in need. This past September TOMS celebrated a huge milestone: 1 million shoes have been donated. TOMS is expanding their “One for One” movement to aide in helping more people around the world. They have expanded their company to include a new eyewear line. TOMS eyewear line, One for One™ means more than just giving eyeglasses. While prescription eyeglasses are a part of the holistic eye care TOMS supports. They’ve set up their approach to be able to address the most widespread needs. 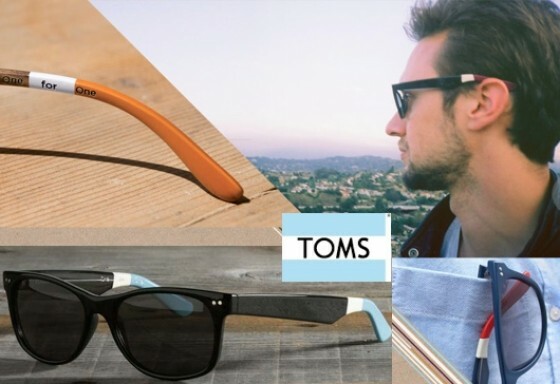 So one person buys a pair of TOMS glasses, and one person receives the eye care that he or she needs.